As you may remember, back at the beginning of the month, I showed you a teaser of this DIY project. 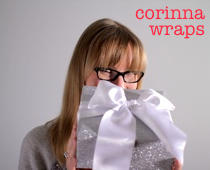 Subscribers to my Gift Wrapping Newsletter got an advance preview of the tutorial, which I share here with you now. But if you want to be part of the insider’s club and see select DIYs and how-tos before anyone else, plus get tips you won’t find here on the blog, sign up for my newsletter! This gift topper doesn’t take much to make, but it has big impact when attached to a gift. Layers of tulle netting and a button detail are romantic and dainty without being delicate, making this a good topper for gifts that need to travel (shipping to another country, say). Why not make several at a time and have them ready for last-minute wrapping occasions? 1. Cut the tulle into squares: You’ll need six squares each of three sizes; the small and large squares should be of the same colour, with the medium-size squares the second colour. 2. Layer the six large squares, rotating them so none of the corners or edges line up but so they’re all centred. Repeat with the medium squares and then the small squares, then stack all three sizes on top of each other. 3. Thread your needle and stitch the stack together in the centre. Use a long, single running stitch, then pull tight to cause the netting to pinch together. Repeat in a few directions. Your goal is to gather the netting to create volume so the fabric doesn’t lie flat. When you’ve achieved a flower-like look (you may need to fluff the tulle a bit), tie off the thread with a knot but don’t trim it. 4. Sew the button to the centre of topper, ending with your needle on the opposite (back) side. Do not trim. 5. Fold ribbon in half and stitch the fold flat to the centre of the back of the topper. Tie off the thread and trim. To finish, cut the ribbon ends (the right way!). To attach your topper to your gift: Tie a ribbon around your gift as usual, but knot it instead of tying a bow. Then use the ribbon tails at the back of your topper to tie it to the centre of the ribbon on your gift. Don’t miss out on being the first to learn what to do when you’re a little short on wrapping paper — sign up for the Gift Wrapping Newsletter before the next issue, early October.